Burger Chef SW Poster Promotion Display: Burger Chef ran two popular promotions to coincide with the Star Wars craze of the late 70's. One promotion offered seven funmeal trays, while the other featured four give-away posters. All four promotional posters can be seen here. 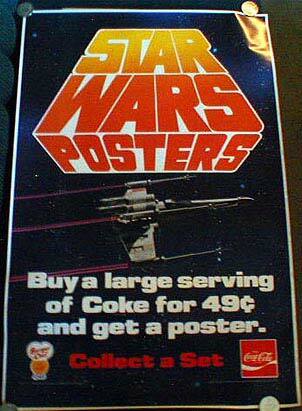 The display poster shown above probably hung in restaurant windows or walls to advertise the 1977 poster give-away promotion. It is one of several types of displays used for this promotion. The graphics are quite vibrant and eye-catching making it a popular albeit extremely rare store display for Burger Chef collectors.